So naturally I went into target to get some body wash, allergy medicine, and a few groceries and it turned into a full on dressing room try on. I’ve been obsessed with the Prologue line at Target for a while now. 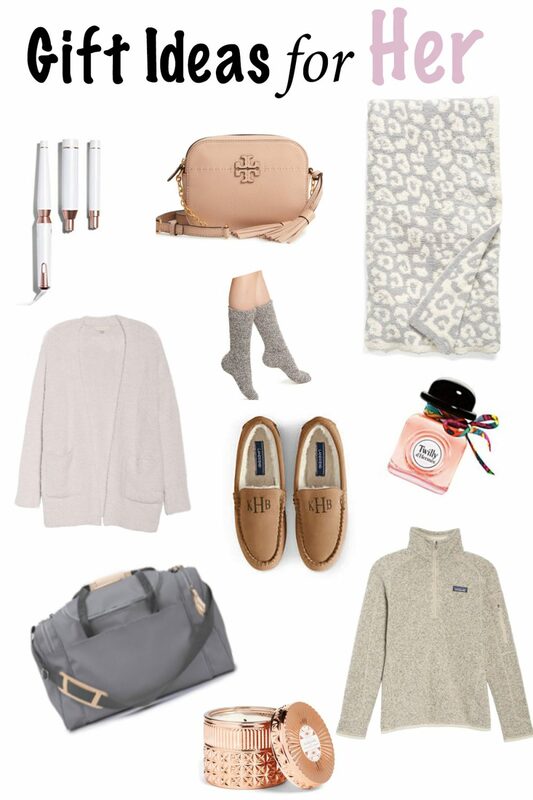 Minimal, chic, and neutral speaks to me and I cannot say enough about the quality of all of the pieces I’m sharing. I’ve had these two tee shirts (here and here) from the Prologue line and wear them over and over. Head over to my Instagram to check out the try on video or click through the links below, Enjoy! 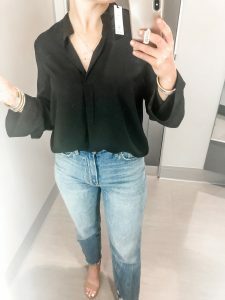 First up is this black long sleeve top. The fabric on this one is outstanding and hangs nicely. The sleeves are wide at the cuff and I think it looks perfect with a front tuck. This is the same top but in white. 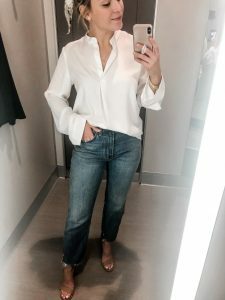 If you are in need of a basic white blouse I highly recommend this one. 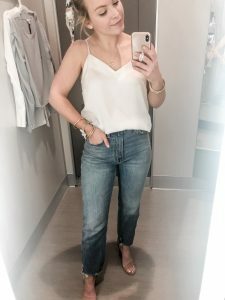 I’ve been eyeing this silk tank every time I walk by the clothing section in Target. Even from a distance, it looks so much more expensive than it really is. It’s a soft, silky material that is not see through and has adjustable straps. Perfect top for Spring and Summer! 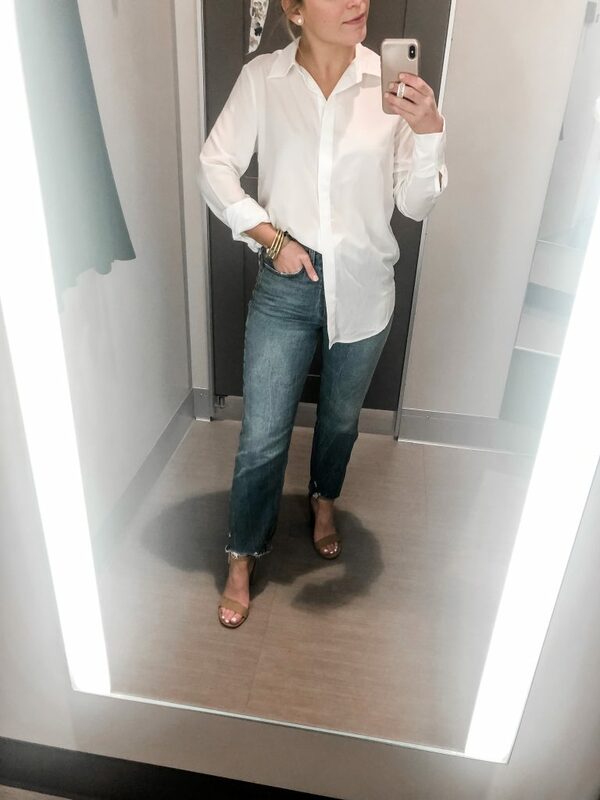 I have been on the hunt for the perfect white button up. Let me introduce it to you here. 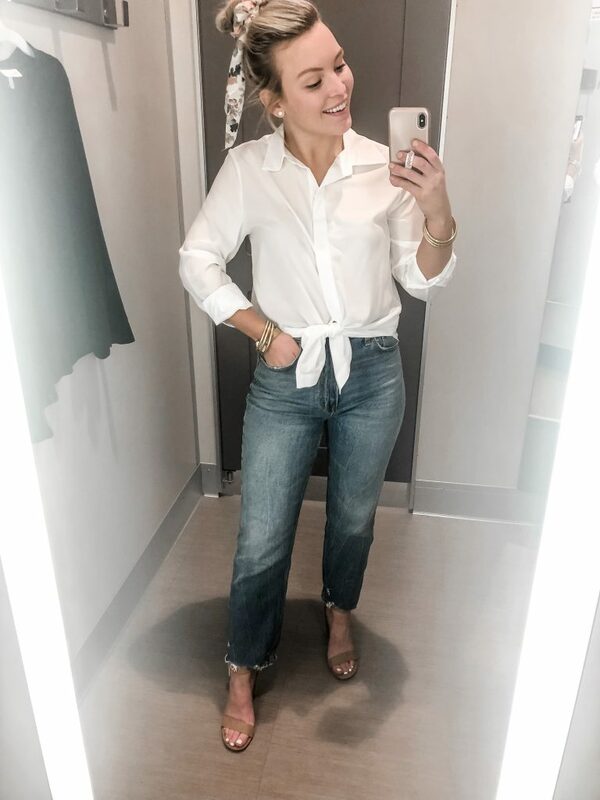 Y’all, if you need a white button-up (which you do) go order this one now! It is not see through, will not wrinkle, and it made from the slinkiest fabric. I think it looks so cute tied with these boyfriend jeans, or with a half tuck, and some strappy heels! I wish y’all could have seen my face when I put this top on. I just knew the sleeves were going to be weird and puffy. Wrong. It’s the most gorgeous grey color and the sleeves are so pretty. Again, the fabric is a drapey, slinky material. What can I say, I love white tops. 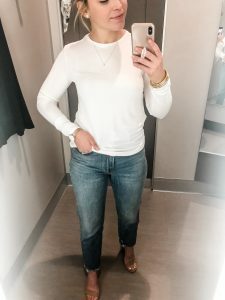 If you need a long sleeve white basic (which you do) I HIGHLY recommend this one, especially for Spring and Summer. 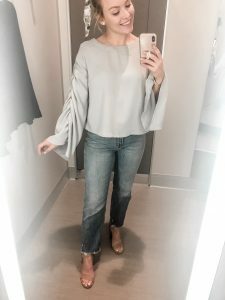 It’s made from a fabric that’s similar to what you would find in workout clothes, so sweat showing will not be an issue (which is a plus for us gals in the South). This one comes in black also (here). If you watched my Insta stories then you heard me say that this is too nice for Target. No hard feelings towards Target, this just truly feels like something that would be found in a nice boutique with a much higher price tag. 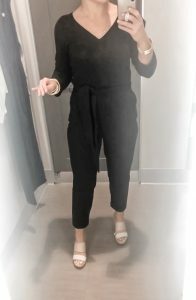 Pantsuits never fit me correctly and I always have to get them tailored so I was quite surprised when this one fit like a glove. The length is perfect and the material is a stretchy material. This would be perfect for a bachelorette party, wedding, or any semi-dressy event you have coming up! For reference, I am 5’4 and have on the XS. 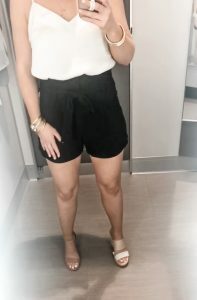 I am in love with these paper bag shorts and currently just need somewhere to wear them! They are high waisted and actually hit at your waist. I love the fabric and it won’t wrinkle when you walk. For most of the pics, I had on these strappy heeled sandals that are very similar to my Sam Edelman ones. These have a taller block heel than my current ones and do not have the same comfy sole. But, they are a great alternative if you’re looking for something with a lower price point ($29.99). 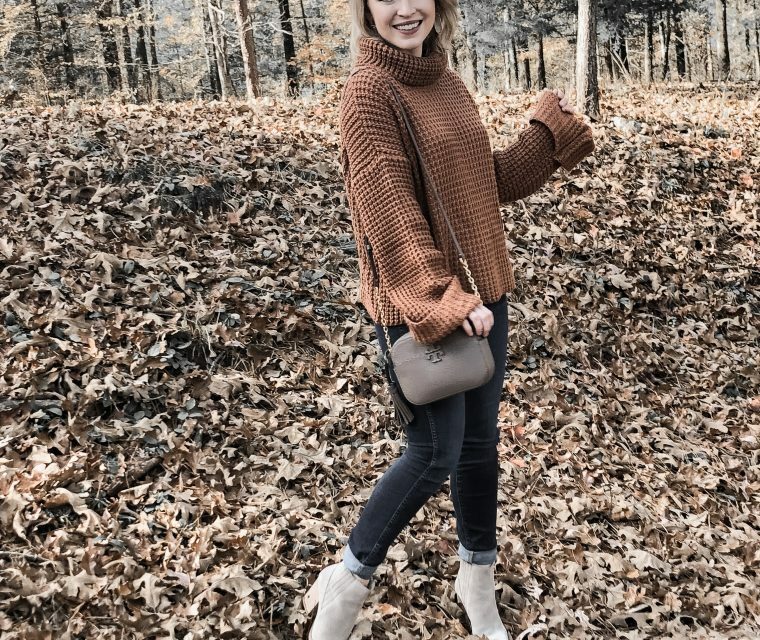 I loved these wedges when I saw them and had to try them on! They are super comfortable and can be worn with so much. Definitely a must have for Spring and Summer. *All items are linked through affiliate links. If you purchase an item through one of these links there is a chance I will earn a commission.